The Dell N743D FTLX8571D3BCL 10Gb/s SFP+ transceivers are designed for use in 10-Gigabit Ethernet links over multimode fiber. The N743D FTLX8571D3BCL is compliant with SFF-8431, SFF-8432 and IEEE 802.3ae 10GBASE-SR/SW. Digital diagnostics functions are available via a 2- wire serial interface, as specified in SFF-8472. 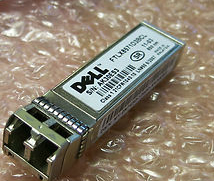 An open SFP+ port in a compatible product is required to install the N743D FTLX8571D3BCL 10GBs module.